C# know-how is a must if you want to be a professional Microsoft developer. It's also good to know a little C# if you're building tools for the web, mobile apps, or other development tasks. 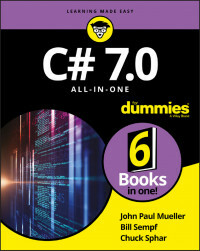 C# 7.0 All-in-One For Dummies offers a deep dive into C# for coders still learning the nuances of the valuable programming language. Pop it open to get an intro into coding with C#, how to design secure apps and databases, and even pointers on building web and mobile apps with C#. If you have a basic understanding of coding and need to learn C#—or need a reference on the language in order to launch or further your career—look no further.